I have written a program that simulates volleyball using rally scoring. In rally scoring, the team that wins the rally wins the point, regardless of which team is serving (for this reason my program ignores the issue of who’s serving). Games are played to a score of 30 and must be won by at least 2 points. I actually have my program working. My problem is that I don’t understand why when I use a different version of the simOneGame function within my program, the program’s final output is so drastically different (and wrong). The simOneGame function that generates good output is not commented out. The simOneGame function that generates bad output is commented out and has “#Why does this not work?” printed after the function definition. An explanation of why the bad one doesn’t work would be greatly appreciated. Thanks. print "This program simulates a game of volleyball between two"
print "indicated by a probability (a number between 0 and 1) that"
print "the team wins the point." # abilities are represented by the probabiltiy or winning a rally. # Returns final scores for A and B. ##def simOneGame(probA, probB): #Why does this not work? ##    # abilities are represented by the probabiltiy or winning a rally. ##    # Returns final scores for A and B. # a and b represent scores for a volleyball game. # prints a summary of wins for each team. You do not allow for an equal condition in the commented code. Since you did not say what "wrong" is, we can only guess. sorry. By "wrong" I mean that if you give each team probabilities of .5, for example, team A will win something like 97% of the time. When equal probabilities are given to both teams, they should each win approximately 50% of the time. the fact that team A loses (line 2 skipped) doesn't necessarily result in incrementing teamB's score. That said, even the "working" case doesn't seem to be correct. You need to calculate random() once, normalize it to (0, 1) and compare to probA. 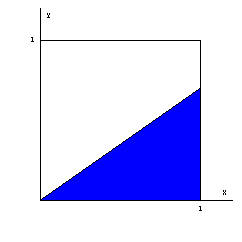 p = 1 - probB/(2 * probA) if probA >= probB (in this case the blue area is the complementary of a triangle). From this you could compute numerically the probability that each team wins the game. As nezachem remarked, your other law leads to different probabilities. The idea of strengths of teams is nice, but the method is little intriguing. Considering the case is for two teams competing each other the probability should be ok, just ask probA (as probB would be 1 - probA) and check for if random() < probA: Input could be in percent and you can divide it by 100 before use. probability that it wins a point. @Grib: Maybe your solution is reflecting the fact that you are mathematician. Thanks sharing the analysis, regardless of it's relevance to OP. For me, even though I did basic statistics, it is allready good reminder that one point winning probability does not equal match win. Here would be actually one more step to go as volley ball games are not likely to include only one set. Finally it would be interesting to see probability of team winning championship with constant probability of winning a point (N x N matrix for N teams). If you define clear rules for the championship, we can try to write a function. Interesting in any case how deceivingly simple problem can give rise to interesting maths even to sophisticated mathematician. The "shape" of problem is nice, but realistically it lives in mathematic space not real world. Winning probability is function of time, even if the team is the home team or not, I think. That's where computers enrich mathematics by letting us simulate systems with many parameters, when theoretical formulas are out of reach. The simulations may lead to new points of view on the system and tell us which properties to study. I think many people use python this way. You can use the calculating power of computers to explore properties of mathematical objects. Many things can be visualized, like cahotic dynamical systems, solutions of partial differential equations, spectra of operators, etc. You obtain representations that were impossible in the past. Python 3: exceptions to a rule: issue with my logic?